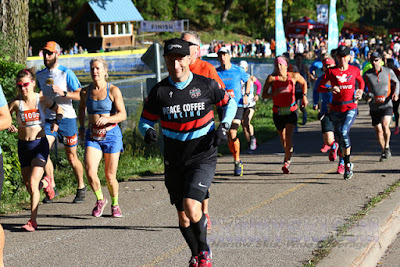 After a four year hiatus, I decided to run the Trail Loppet Half Marathon again this year. The reasons for my hiatus were twofold. First, in 2015 Erik and I began trail marking for the City Trail, Tri-Loppet, and Trail Loppet. 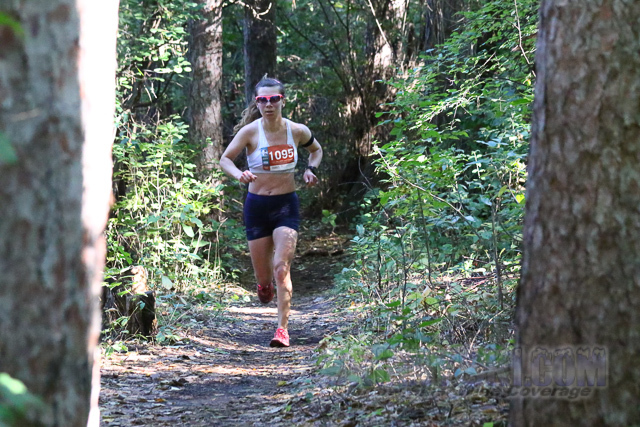 Marking trail takes a lot of time and the mile per hour pace is excruciatingly slow which equates to lots of standing and terrible rest before a race. Second, after doing the Trail Loppet a couple years in a row I wanted a break and have done some different races in the past few years. But this year I wanted to do it again, partly because I’ve been going back and trying to shatter all my old slow running times and given my previous Trail Loppet times were 2:04 in 2013 and 2:07 in 2014, I figured I should be able to go sub-2 hours without any problem! My training leading up to the Trail Loppet wasn’t ideal. After my patellofemoral knee pain in the late winter and spring, I didn’t run more than seven miles for a couple months after my 25 km trail race in May. Then I focused so much on speed for my sub-6 minute mile attempt that this didn’t leave much time for training distance. By the end of August I managed a 9.5 mile run and then promised myself I’d get lots of good trail time and altitude training on a backpacking trip in New Mexico. 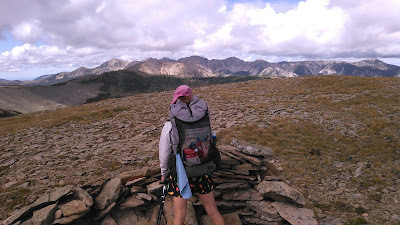 Mother Nature had other plans and I missed the memo that it was monsoon season so I sufficed myself with afternoons in the tent during thunderstorm-hail showers that at least I was getting in some training because we were above 10,000 feet. 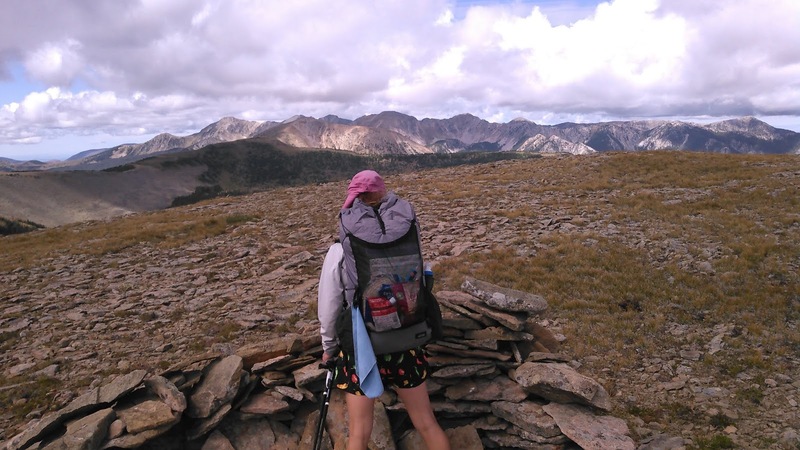 We managed to hike so little that I didn’t poop for three days! Once back in Minnesota, a week before the Trail Loppet, I easily pounded out an almost 12 mile run without knee pain. Apparently my accumulation of 15+ mile runs have paid off. The day before the Trail Loppet I woke up feeling fine. I planned to get out of work early to mark about a 3 mile portion of the course before it got dark. By mid-morning, I started feeling a little feverish. This slowly started intensifying and I shivered after lunch. I had a mild sore throat and headache but otherwise didn’t feel too bad. I arguably should have left work, but find it hard to justify leaving work sick when I feel good enough to bike home so I stayed. 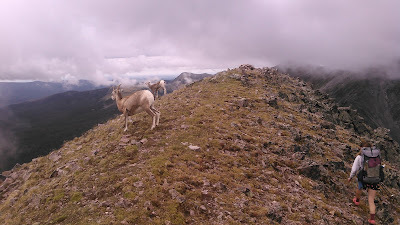 And I felt way too guilty to get out of trail marking so I biked over to Wirth. Trail marking went fine except that if I landed too hard on my feet on the downhills it made my headache worse. Sometimes in these situations I suffer in silence but I knew I should tell Erik how I was doing (after he remarked that I was breathing really hard after walking up a minor hill). I decided that if I felt this bad in the morning I shouldn’t race as it would be miserable. This might be an obvious decision for everyone else but I’m a big sucker for punishment. Back at home I checked my temperature. I can’t say I was too surprised that it read 100.1. Yup, definitely a fever but I’m probably not going to die. I made some pesto and remarked at how rough my fleece pants were on my skin. I went to bed early, deferring a decision to race to see how I felt in the morning. Only it was hard to fall asleep because I was breathing hard and when I checked my heart rate it was 77! My fever broke early on in the night and I felt fine when I woke up so decided to race. Plus, I had to finish to get my race swag socks:) I thought about maybe running easy but I signed up to race in the fast wave so ultimately I decided to just see how my body felt. And I guess my body felt reasonably good because my first three mile splits were all 8:20 or better with the fourth mile at 8:37. Although it should be noted this was the flattest part of the course. After that my pace slowed, the hills kept coming, and there were a few logs and pipes to go over. Somewhere in the next few miles I decided today wasn’t a good day to fight my body and succumbed to a “comfortably hard” pace where I was pushing just a tad. I figured I was already tempting fate by running the day after a fever and didn’t want to make my body work too hard. Per my Garmin my pace dropped into the 9-11 minute/mile range while my heart rate stayed pretty consistent thanks to the uphills. 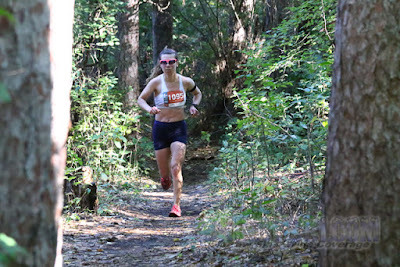 As a trail race, the downhills are important, too, and I at least took some satisfaction that people would catch me on the uphills and I could run away from them on the downhills. The night before I had marked the section through Eloise Butler and this was my first time racing a section of course I had marked. It would have been ironic if I got off course here but I didn’t. Sometimes there were volunteers in this section telling us where to go and they didn’t know I had marked this section. I did take note of what marking styles were most effective and where I could have done better. In the last third of the race I could tell I had more to give but hung back a bit. This is also where I reminded myself that running up big hills is hard work and no wonder my previous Trail Loppet times were over 2 hours! Erik was cheering for me near the end and I picked it up a bit but didn’t bury myself to the finish. The weather was picture perfect and I managed to finish 34/195 women and just under my 2 hour goal at 1:57; however, my Garmin clocked the race at only 12.58 miles so had it been a full half marathon I would have been over 2 hours, but not by much and I probably would have still had my fastest Trail Loppet which is a bit impressive given how I had felt 15 hours earlier. With all the rain in the days prior to the race we were warned there might be some standing water on course. The distance was slightly shortened to avoid any “swimming” sections and beyond that the worst of the water came a quarter mile into the race on the paved Luce Line Bike Trail. Aside from that, the only other unavoidable muddy sections also came on paved sections that had obviously recently been underwater. I guess this says kudos to all the Loppet workers and volunteers over the past years who have created very well draining non-paved hiking, biking, and skiing trails at Wirth! I’m also happy to report my fever never returned so it was probably some mild viral illness that 10 hours of sleep cured.